A group that makes their debut at the prestigious Kennedy Center in Washington DC is likely to be headed for some interesting places. 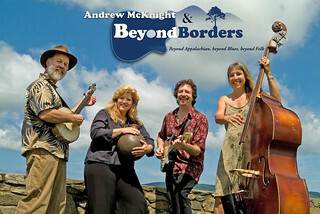 Going "beyond Appalachian, beyond blues, beyond folk", Beyond Borders describes this collective creative force in many ways - stylistically and artistically. These four seasoned musicians and consummate professionals bring an exciting, unique and dynamic presentation to the stage, blending their individual talents with a genuine warmth with each other and their audiences. The intricate harmonies of two male and two female voices sparkle in constantly shifting combinations. They blend those voices and Andrew's signature acoustic and electric guitars with a wide array of instruments including upright bass, drums, banjo, and percussion to create "a vast expanse of song and sound." Originally joining forces in 2008 to bring Andrew's Something Worth Standing For CD to the stage, the band has added much to their eclectic arrangements of his masterfully crafted songs. They have put their own rootsy-rock stamp on traditional music with "Worried Man Blues", "Sittin' on Top of the World" and their fiery medley of "Red Haired Boy"/"Salt Creek". Since 2011 they have been collaborating writing and arranging a full set of new songs featuring each of the members. They continue to push the creative envelope, challenge genre boundaries and have a great time doing so with each other and their audiences. Multi-instrumentalist Les Thompson was with NGDB until 1973, spanning their rise to popularity with hits like "Mr. Bojangles" as well as the band's landmark platinum record, Will the Circle Be Unbroken?, with Doc Watson, Earl Scruggs, Mother Maybelle Carter and other legends of American music. Since leaving the band, Les has produced and/or engineered numerous other audio and television projects including a series of ABC After School Play Breaks. Always fascinated by the recording process, his Cabin Studios has been a destination for the region's acoustic bands for nearly two decades, including Larry Burnett of Firefall, string whiz Danny Knicely, and gypsy-jazz string band The Woodshedders as well as three of Andrew's last four CDs. Since 2013, he has occasionally joined fellow NGDB member John McEuen and John Carter Cash for a multimedia concert retrospective on the Circle album and the Carter Family, including on PBS Music City Roots. Born and raised in Louisiana, Stephanie Thompson is a gifted musician in multiple ways - blessed with a soft and sweet alto voice, she is equally at home singing her own songs or picking a traditional tune like "Red Haired Boy". Her "What Kind of Person?" was recorded by Rani Arbo and Salamander Crossing. In Beyond Borders she is the consummate utility player - upright bass, acoustic guitar, hand percussion and more - and adds as much of the colorful ornamentation as the solid underpinnings to the sound. She appears on three of Andrew's CDs before teaming up in the band. She and Les have a deep love of traditional Appalachian music and can be found jamming at many of the region's oldtime music festivals. Singer and songwriter Lisa Taylor entranced the Washington DC music scene with her 1995 debut CD Sibling Rivalry, earning seven Washington Area Music Award nominations. Shortly afterwards she played drums and percussion on Andrew's second CD, Where This River Runs. She devoted the next decade to raising her daughters, but triumphantly returned to recording and performing in 2008 with her award-winning solo CD True North. Her skillful chops on the drums draw from jazz, rock and world music influences, but her tasteful employment of her talents is a true sign of a master musician.